Gviz is a really great package for visualising genomics data in R. Recently I have been looking at stranded RNA-seq data, which provides the ability to differentiate sense and antisense expression from a genomic locus thanks to the way in which you generate the libraries (I won’t go into all that here). Most aligners are strand aware so retain this useful information, but there aren’t many (any?) well defined approaches for detecting antisense expression nor for visualising it (in R). 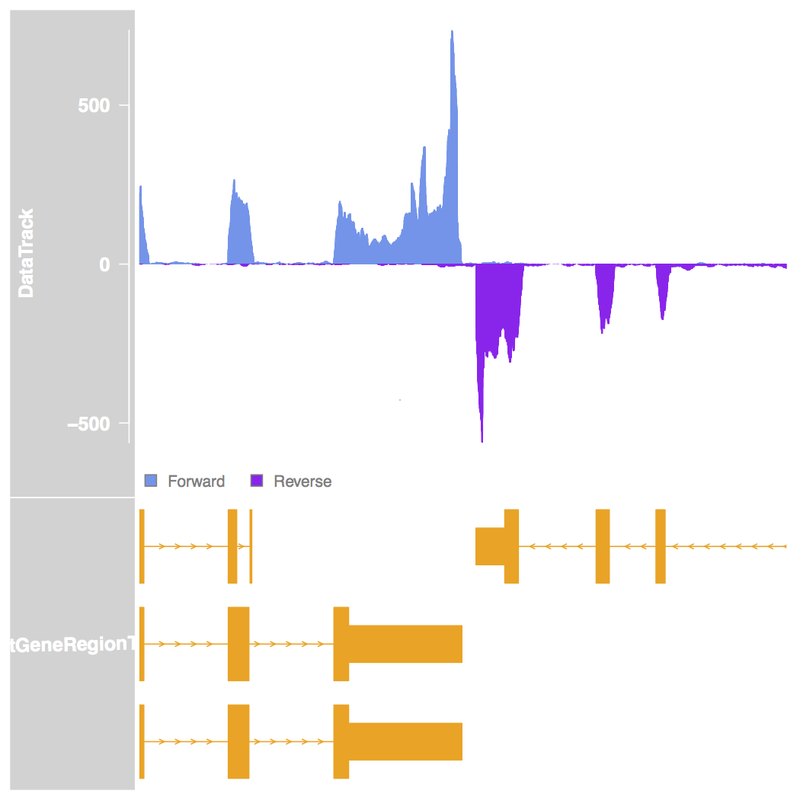 So, here I set out to use Gviz for the visualisation of stranded RNA-seq data. A quick google got me to this post on the BioC mailing list from the Gviz author in which he provides a function to separate the reads in a BAM based on strand. This is not the same thing as working with stranded data – stranded data still has reads aligning to both strands, it’s the orientation of the pairs that determines which strand of the genome was being expressed. But, the post was a useful starter. We then combine these such that all pairs of reads originating from the forward/top/5′-3′ strand are together in one GRanges. This is repeated for the reverse/bottom/3′-5′ strand with reads in the F1R2 orientation. We then calculate coverage over the region of interest and return a GRanges object with this data that is used by the dataTrack in Gviz. The full code for this is in this GitHub gist. Strand specific coverage can be plotted in a Gviz data track using using a custom import function. The top track contains the per-base coverage with reads from the forward strand in blue and reads from the reverse strand in purple. The bottom track shows the genomic context of the reads with exons in thick lines, introns as thin lines as the direction of transcription indicated by the arrows on the think lines. Here the two genes are on opposite strands and are transcribed toward each other, making for a nice example. To leave a comment for the author, please follow the link and comment on their blog: Bioinpharmatics » R.